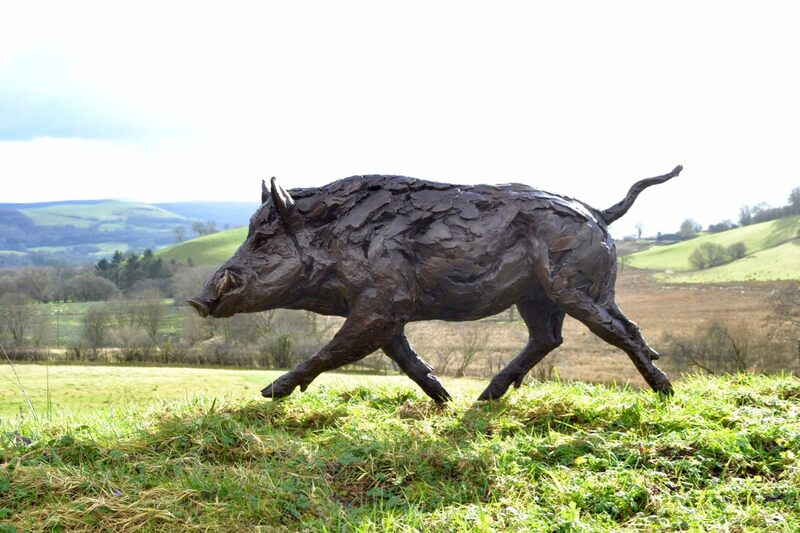 The Wild Boar sculpture by Tanya Russell, MRBS. Limited edition, from the ‘Gardens’ sculpture range. Handmade in England. Bronze Resin (Limited Edition 25) Price £3,840. Foundry Bronze (Limited Edition 25) Price £13,010. To purchase this Wild Boar sculpture please contact the artist. As this artwork is handmade colour can vary slightly. Bronze Resin (known also as Cold Cast Bronze) is made from a polyester epoxy resin with real bronze powder mixed into the surface layer. The final product is patinated (a term that describes the reaction of chemicals with the bronze powder in the surface) to give it a very similar colour to foundry bronze. Foundry Bronze is made from molten metal using the lost wax method. Bronze metal is a blend of copper and tin along with other metals to give different characteristics to the final product. Both forms begin as a clay or wax sculpture, from which a mould is taken, but Foundry Bronze casting is a costly and time-consuming process. Cold Casting allows for faster production and a more affordable sculpture. The Wild Boar sculpture was commissioned to join a sculptures of several deer and a fox in a garden in Warwickshire. Working on a large scale on garden pieces is always a pleasure because the sculptures are designed to appeal from a distance in setting. The large marks help create a sense of movement and life, and I had a lot of fun sculpting the piece. When I model animals I try where possible to find examples from life, but where I can I also use many photos – often hundreds – showing the animal (and other animals of the breed or species). This helps me sculpt their anatomical features, the way that their skin lies over their muscles, and their different poses and attitudes.